LONGBOARD MAGAZINE VOL.1 NO.3 1993 SURFER MAGAZINE.HARD TO FIND ISSUE, MIKE HYNSON, BIARRITZ SURF FESTIVAL, CLASSIC SECTION VINTAGE WOOD 1930'S 40'S 50'S. Condition is Very Good. Shipped with USPS First Class Package. Longboard Magazine. The Art of Surfing 2007. 40 pages of Surfing Art. Covers and all pages are securely attached. No markings. No labels. WITH98 PAGES. THE CONDITION OF THIS MAGAZINE ISNEW WITHNO MISSING PAGES ORCUTOUTS. AND MUCH MORE! LONGBOARD MAGAZINE. Pictures are the exact magazine. About 138 pages. The magazine is complete. It is slightly rolled. The covers show slight wear. MAY-JUNE 1999. SSEPTEMBER 1981 ISSUE OF SURFER M AGAZINE. MAG IS IN GOOD CONDITION WITH CENTERFOLD AND ALL PAGES INTACT, LARGE SQUARE CUTOUT ON BACK COVER. LONGBOARD MAGAZINE. PHOTO ANNUAL. Magazine is in good condition with no missing pages and no cut-outs. There is minor wear from being read. Corners are slightly bent. NOVEMBER-DECEMBER 1998. Pictures are the exact magazine. THE CONDITION OF THIS MAGAZINE ISGOOD WITHNO MISSING PAGES ORCUTOUTS. THIS SERVICE HAS BEEN VERY SLOW! Cover: Robin Kegel. Longboard Surfing #89 Magazine from 2006. THE CONDITION OF THIS MAGAZINE ISGOOD WITHNO MISSING PAGES ORCUTOUTS. HOBIE ALTER SPEAKS. WITH144 PAGES. THE CONDITION OF THIS MAGAZINE ISGOOD WITHNO MISSING PAGES ORCUTOUTS. Gary Propper. Longboard Magazine 7-6 99. I am not an expert on grading. There is little doubt that LongBoard Magazine was one of the best surfing publications on the market. In this issue, 1970s surf star Reno Abellira pens "Ticket to Ride," a world travel feature that goes the distance. 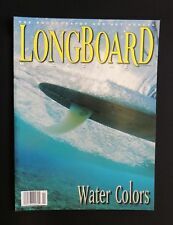 There is little doubt that LongBoard Magazine was one of the best surfing publications on the market. If you surf and you haven't been to Indo yet, you need to go. Mark Fragale pens a profile of legendary shaper Dave Sweet. Billy Al Bengston. Longboard Magazine 5-3 july 1997. New England. Secret Pacific. In Good Condition. Complete mag with no missing pages. Otherwise ok.
Longboard Magazine 5-1 Mar 97. Travel Edition. Longboard Magazine 10-2 2002. My wife and I started surfing in New York in 1962 moved to California in 72…kept surfing …till we moved to Joshua Tree 2 years ago.we have been gathering all those years……. JUNE 1986 ISSUE OF SURFER M AGAZINE. MAG IS IN VERY GOOD CONDITION WITH CENTERFOLD AND ALL PAGES INTACT.